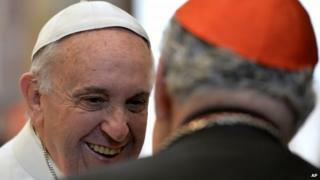 Pope Francis has named 20 new cardinals, including churchmen from Tonga, Ethiopia and Myanmar. Fifteen of the new appointees are under 80, making them eligible to enter a conclave to elect the Pope's successor. Pope Francis said the appointment of cardinals from 14 countries from every continent in the world showed the Vatican's "inseparable link" with Catholic Churches around the world. They will be formally installed on 14 February. Pope Francis also announced on Sunday that he would lead of meeting of all cardinals to discuss reform of the Roman Curia, the Vatican's administrative body, on 12 and 13 February. The list of names includes five retired bishops who will join the College of Cardinals but are over 80 and so cannot take part in a papal election. It is the second time Pope Francis has announced the appointment of new cardinals from a wide variety of countries. Last January he named 19 new additions, including churchmen from Haiti and Burkina Faso, which a Vatican spokesman said reflected his commitment to the poor. Appointing cardinals is the most powerful way for the Pope to shape the Catholic Church, says the BBC's Religious Affairs Correspondent Caroline Wyatt. He has now chosen over a quarter of all cardinals able to vote for the next Pope. With his appointments, Pope Francis appears to be trying to reflect the diversity and growth of the Church in developing nations, our correspondent adds. In his a pre-Christmas address to cardinals, Pope Francis sharply criticised the Vatican bureaucracy, complaining of "spiritual Alzheimer's" and "the terrorism of gossip". He has previously said the Roman Catholic Church must strip itself of all "vanity, arrogance and pride" and humbly serve the poorest in society.